Welcome to your fall finale! The Sinnerman is being brought in for questioning and Lucifer is chomping at the bit to have another go at the guy, only Lt. Marcus Pierce says that no one is talking to the Sinnerman, except for him. Well, we know he’s got seniority and all that but that’s a conflict of interest since the guy killed his brother. No matter, Det. Chloe Decker steps into the interrogation room while Pierce and Lucifer are arguing about who has the right. Later, in comes Ella with the Sinnerman’s phone and the video of the girl: The Sinnerman says the only way to save her is for him to take them to to her because he’s not not telling them where she is. 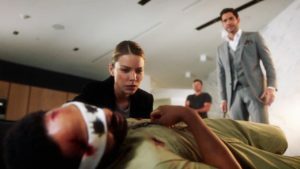 Understandably, Pierce is not on board with this because it might be a ploy so he can escape, but Lucifer suggests that taking the Sinnerman out is the best course of action but – of course – no one listens. In the meantime, Chloe and Lucifer run down additional leads about the missing gal, Maggie Cole. She does roller derby and there seemed to be some kind of beef but as Lucifer suspects, all dead ends. Chloe and Lucifer do manage to locate her car, but it’s rigged with a grenade and explodes when Lucifer because he was in too much of a hurry to wait for forensics. What a shame. However, this does have the added bonus of Chloe being on Lucifer’s side and she agrees to take the Sinnerman out of custody to find where Maggie. Getting the Sinnerman out involves a rather silly ploy: Ella unknowingly distracts Pierce while Chloe looks for the keys to lockup in his office while Lucifer and Chloe plant a fake bomb on Dan’s desk. Chloe, Lucifer and the Sinnerman pretend to be bomb squad and they are home free. But Pierce seemed to know what was going on and decided the Sinnerman wasn’t leaving custody without him. True to his word, the Sinnerman leads everyone to where Maggie is located and they rescue her, but not before the Sinnerman and Lucifer disappear. Thankfully, Dan did some research when Chloe and Lucifer began working together (remember?) and he has a file on Lucifer that includes all properties he owns in Southern California. Chloe makes a very educated guess about which property Lucifer has the Sinnerman and – of course – she was right. 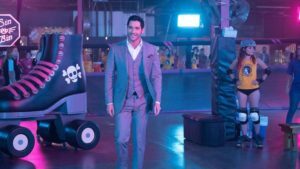 Chloe and Pierce get there just in time as the Sinnerman is trying to get Lucifer to kill him. Pierce shoots and kills the Sinnerman and now he’s gone. So what happened with Maggie Cole? She made a deal with the Sinnerman because she wanted to be the top dog in her roller derby league. The gal who was her main competition for lead jammer was killed in a car crash, which is never what she wanted to happen. The Sinnerman called Maggie and told her she had to stage her own abduction, which she did as her payment for the “favor.” So that’s all tidied up now. And yet something isn’t sitting so well with Lucifer. Lucifer had Maze torture the Sinnerman and all she was able to determine was that he was a human and not a celestial being. Lucifer thought killing the Sinnerman would be the answer to all his problems but, apparently, angels killing humans is “no nos 101” according to Maze. Despite some major taunting from the Sinnerman, Lucifer realizes that he can’t kill the man and as he keeps telling Lucifer that has to kill him, that’s when Lucifer realizes that the Sinnerman didn’t have an accomplice, he is the accomplice. So whom was he working for? That would be our dear Lt. Marcus Pierce, who – by the way – is also Cain: the first and original murderer. To be continued. Dan might be a superdad, but he’s failing at finding a babysitter for Trixie. He brought her to the station because he forgot about her random off day at school, so she’s coloring in a crime scene photo like the cool kid she is. By some random chance, Dan runs into Charlotte Richards (former defense attorney and now a member of the DA’s office) at a coffee shop and Trixie takes it upon herself to have Charlotte babysit her. Trixie doles out some pretty sage advice to Charlotte while being babysat and the two end up having a really good time together. When Dan comes to pick Trixie up, he suggests that he and Charlotte should go get that coffee together, but Trixie suggests that dinner would be more romantic. Both agree to dinner and I think we all can agree that Trixie is an excellent wingman…person…kid. I can only imagine what she will be like when she’s older.